Yesterday (5/12/11) was the biggest day so far in ColaLife’s development. It started with a presentation to the Johnson & Johnson Africa Contribution Committee (ACC). It seems that this committee reviews all of Johnson & Johnson’s social investments in Africa and holds its meetings in different African countries on a peripatetic basis. Both of our key contacts were present at the meeting and it was great to be updating them of the progress we were making on our new home territory. There is huge interest and willingness to support ColaLife and a realistic understanding that we will have successes and set-backs over the next two years and that we need to learn from both. The relationship with Johnson & Johnson feels right. There is a feeling that we are in this together. There is a real sense of partnership. Despite the flakiness of our internet connection at times, I have taken to using the online SlideRocket system for presentations. The presentation that I gave to the Johnson & Johnson committee is embedded below. I recorded an audio track on my phone using AudioBoo but have been unable to upload it due to a poor internet connection over the last few days. I will add the audio when I can. You will need to be online to view this (go online now). After the presentation we went over to the DfID section of the British High Commission to set-up for the kick-off meeting with implementation partners which ran from 3-5:30pm and could have gone on for a lot longer. We worked most of the weekend preparing for this and it went really well. Jane did most of the brain work and I made the props! We used a technique described to us by our friends at Boxwood to surface issues arising from the supply chain aspects of the projects. The technique works like this: you use a model, or the actual item to be distributed and you give it to a person from the first organisation in the supply chain. They describe their role to everyone else and hand the item to a person from the second organisation in the supply chain. They describe their role and pass to a person from the third organisation and so on until the item reaches the customer. Of course it doesn’t go as smoothly as I have just described as the whole process generates discussion and questions and deepens the understanding of the process for all those involved and those observing. 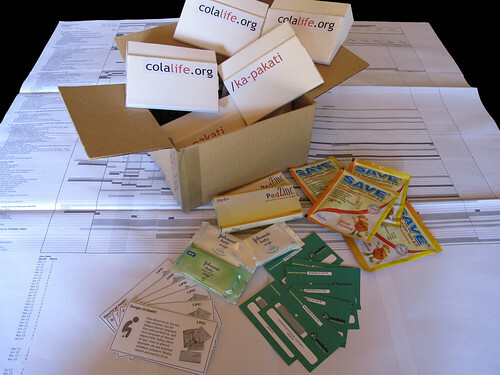 In the ColaLife Trial we will be distributing two things: the vouchers and the anti-diarrhoea kits (ADKs). In the case of the vouchers there is also a redemption process to consider and in the case of the ADKs there is the process of procurement of the packaging and the components and the assembly of the ADKs that all needs to be taken into account. Both of these exercises took a lot longer than we anticipated but worked brilliantly at surfacing the issues and deepening collective understanding. We had intended to follow these exercises with group work to look at the other dependencies in the project but we ran out of time so partners took away copies of the Gantt chart to study by themselves and get back with any issues they may have. We then moved on and joined others at a Reception for ColaLife at the High Commissioner’s residence hosted by the High Commissioner himself Tom Carter. To this we’d invited all the people who had helped us to get this far. Stakeholders attended who had contributed to the trial design but were not now directly involved in the delivery. We hope that many of them will join the trial steering committee to advise but also learn as the trial progresses. Zambia’s Vice President, Guy Scott, attended which was a great honour and it was really good that our contacts from Johnson & Johnson were there too. So we now have everyone re-engaged and thinking more clearly about their role pending the signing of the Memorandum of Understanding (MoU) with the Ministry of Health which is ‘in the system’ and we hope will emerge soon. Once the MoU is signed we will be able undertake an official launch and we will be on our way. Dear Simon, congratulations for all the progress!